I got the chance to try out Ocean's nasal spray for kids, or, rather Sprout did. Surprisingly, he thought that it was great & actually asks, "Squirt my nose!" on a regular basis. He really does think it's fun & always wants to do it himself as well. The spray is quite gentle--nowhere near as strong as the adult versions--good for kids' delicate little noses. It helps clear out the clogged nose when he's got a cold & the saline helps to moisturize & avoid inflammation too. I like that it's just saline--no worrisome ingredients or concerns about dosage. It's safe to use as often as needed. 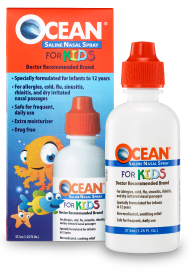 Ocean for KIDS® Saline Nasal Spray is available at pharmacies nationwide and retails for $4.99. Visit www.oceannasalcare.com for more great tips and helpful information. Ocean® Nasal Care is also on Facebook and Twitter! The OCEAN® Nasal Care family of products offers a non-medicated option for allergies that can be used as often as needed, is safe for all ages, and may be used in conjunction with other medications. OCEAN® Saline Nasal Spray has been the non-medicated saline nasal brand recommended most by doctors for more than 30 years. OCEAN Complete® Sinus Rinse (for nasal sinus irrigation and nasal moisturizing), OCEAN for Kids® Saline Nasal Spray (specially formulated for infants and children) and OCEAN Gel® Nasal Moisturizer are also available. Disclaimer: I received a free sample of Ocean Nasal Spray but was not otherwise compensated for this post.